1. Heat a skillet on high with olive oil. 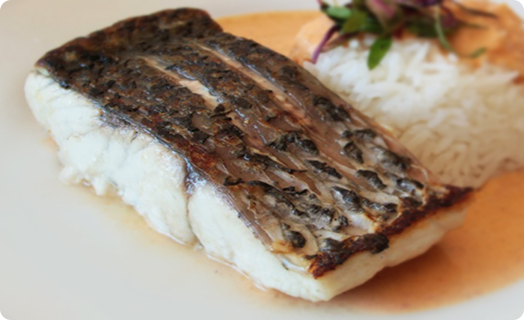 Season the Barramundi with salt and pepper. 2. Once the skillet is smoking hot, place the fish skin side down. Give the skillet a shake to loosen the fish. Cook for 6 minutes or until the skin is crispy. 3. Flip and cook for ten minutes or until fish is cooked through. 4. Make rice according to the package directions and heat a curry sauce of your choice. 5. Plate rice. Drizzle curry sauce over the rice and onto the bottom of the bowl. Place the fish on top and garnish with micro basil.